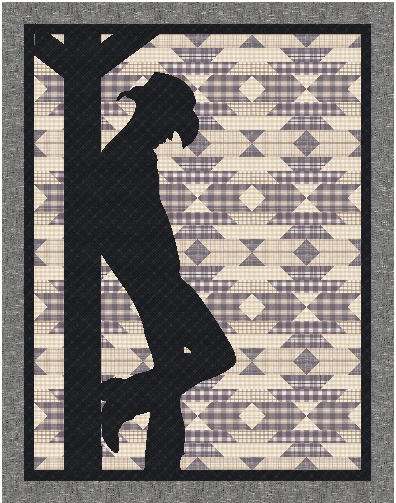 While playing with the Electric Quilt program I designed this quilt… I call it Navahoe Reflections as the background reminds me of a pattern one would find on a horse blanket… and the Cowboy looks to me like he is reflecting on what he needs to do that day or what he has accomplished. Its a lap size 65×83. When writing out the pattern I became aware of a glitch in the EQ8 Program.. I was not aware of this.. I hope this helps! I’m sorry about the issue, but hopefully this solution will work for what you want to do. After doing as asked i was able to get the template to half size and my printer will allow me to enlarge to 200%. this i what the half size looks like on my screen. The pattern is now written but has not been made by me or tested yet.. those of you interested i will sell it at half price of my regular patterns as i have not actually made it yet.